Northern Territory grazier Greg Saunders supports the local onshore gas industry and believes it creates opportunities for landholders. “Gas most definitely can co-exist with cattle,” Mr Saunders says. APPEA, the body representing Australia’s oil and gas industry, is stepping up its communications campaign to highlight the industry’s strong environmental performance in the Northern Territory over the past 50 years and explain the benefits and impacts of further developing the NT’s onshore natural gas resources. The campaign will feature advertising, social media content, websites and a series of community meetings, including a continued presence at regional shows in major centres this month. 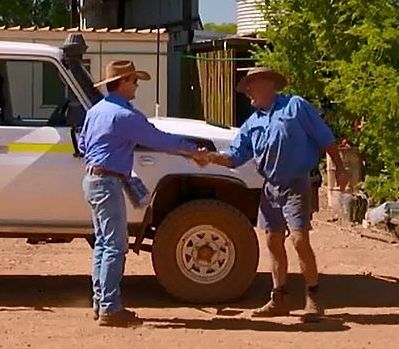 As part of the campaign, a TV commercial featuring Sturt Plateau pastoralist Greg Saunders has aired throughout the NT. Mr Saunders has seen seismic surveys conducted on his property south of Katherine and several wells have been drilled there. Further content will be published in coming weeks. APPEA Director for the Northern Territory Matthew Doman said the industry acknowledged the community has genuine questions and concerns about the impact of natural gas exploration and production, especially in areas where it has not previously occurred. “All too often, concerns are stirred up by false and exaggerated claims. This campaign is about starting the right conversations and providing tools to inform, educate and empower people,” Mr Doman said. “Repeated airing of these alarmist claims – which are unsupported by evidence – does nothing to inform public debate on an industry that could be a significant investor in the NT, generating thousands of jobs and other opportunities for the wider community. “Our campaign is designed to counter those claims and highlight the benefits offered by a well-regulated industry that can only operate once extensive environmental approvals are obtained. A recent study by Deloitte Access Economic found that developing onshore gas resources in the NT could create over 6000 jobs and generate $1 billion in Territory government revenues over the next 20 years. “In the lead-up to next month’s NT election, we are concerned the benefits our industry promises the Territory will be lost to activist scaremongering,” Mr Doman said.